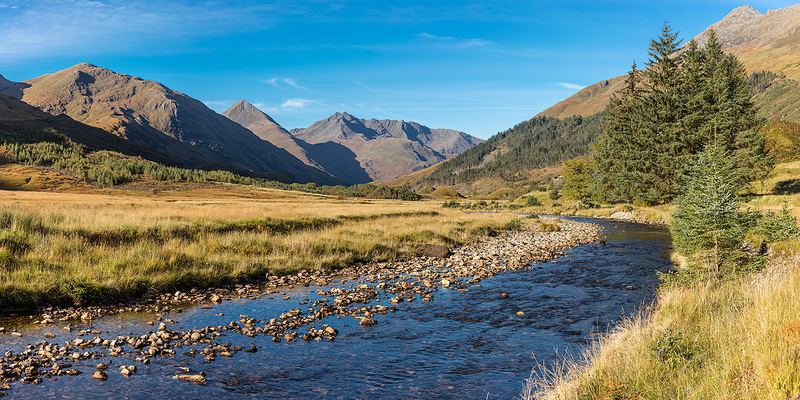 Glen Shiel is arguably one of Scotland's finest glens, and the road that makes its way from Loch Cluanie in the east to the shores of Loch Duich in the west passes some of the grandest and tallest mountains in the entire Scottish Highlands. There is so much here to capture the photographer's eye and imagination. One of my favourite locations is beside the River Shiel where it crosses a bed of alluvial gravel before descending a series of cascades to reach the tiny and secretive Loch Shiel. At this point the valley is enclosed by steep mountain slopes which to the south rise up to the shapely peak of Sgurr an Lochain on the main Glen Shiel Ridge, and to the north to Sgurr na Ciste Duibhe on the Five Sisters of Kintail ridge. Directly ahead, demanding and certainly deserving of one's attention, is the shapely cone of Faochag and the impressive and challenging rocky ridges of The Saddle. With the north facing slopes and much of the lower glen often in deep shadow for much of the day, achieving a well exposed image here can be challenging and at some times of the year almost impossible. Winter is the time for summit photography; more general views of the mountains, the river and the glen itself are best achieved when the sun is higher in the morning sky during either spring or autumn. My image was captured during the first week of October when both the light and also the colours were at their very best. Equipment : Nikon D850, Nikon 24-70mm f2.8 G AF-S ED Lens @ 60mm. Camera Settings : Shutter 1/60 sec, Aperture f8, ISO 100.